I’ve praised Lucky’s dinners to the skies, and they deserve it. They have a great lunch too. 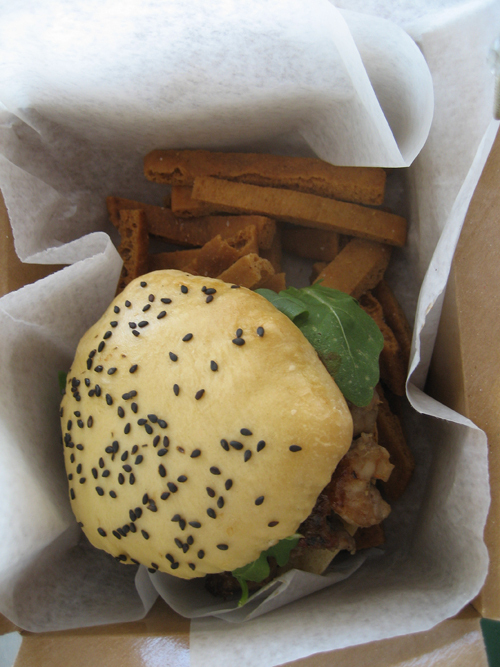 Creative yummy sandwiches at half the price of dinner. I want that, you say, but I want even better sandwiches! And I want them even cheaper! And I want them available at dinnertime as well as lunch! And I want a great view too! Pretty demanding you are, but Lucky’s can do that. 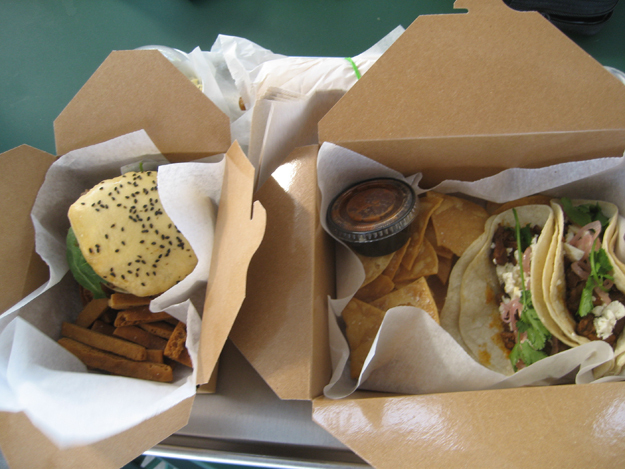 You’ll have to travel a bit north though, to Lucky’s outpost on Guthrie Green. Is this view good enough for you? 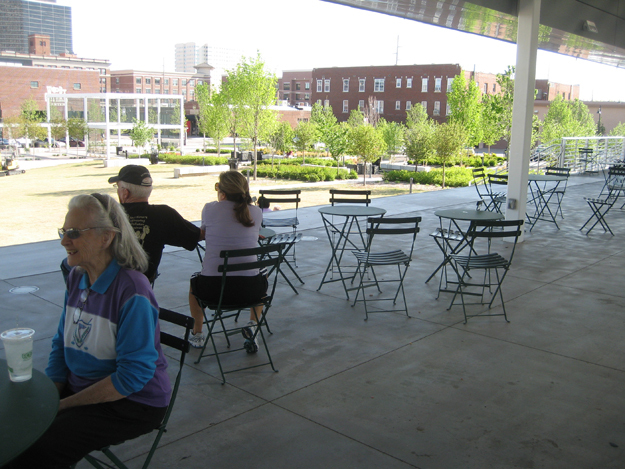 Yes it’s the brand new park in the middle of Tulsa’s revitalized Brady District, a miracle in itself which not so long ago was a barren weedy stretch of forlorn abandoned factories mouldering in the grave just like John Brown. With warm weather finally arriving it’s a fine place to catch some rays, listen to a concert, and eat some great food. We stopped by on a weekday evening with no concert in sight, just park workers, but it was a bright sunny day and a pleasant setting. Chairs and tables scattered on a raised platform above the park, shaded by a big canopy. There’s a glass-enclosed area with a few tables in case of bad weather, and that’s where you get your food. See that green machine on the right? You order your meal using that. You must have a credit card. You type in a name, swipe your card, and then make menu selections, and … well, you’ll figure it out. Actually, one of the cooks had to step out to help me. It must be a mess when there’s a concert in the park and 50 people are lined up trying to use that machine. (There’s a second machine on the other side of the building.) After a short wait (which for me was longer because I recognized the cooks from 15th Street Lucky’s and distracted them with conversation), they give you your tray through the window. We carried it to our table and dug in. 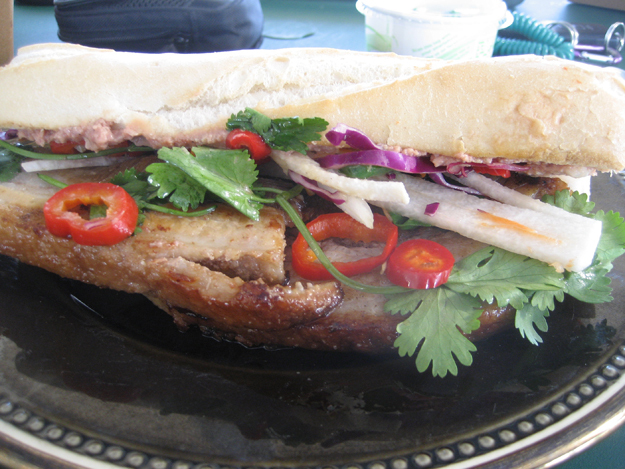 I’d ordered the Rabbit & Pork Belly Banh Mi ($9). 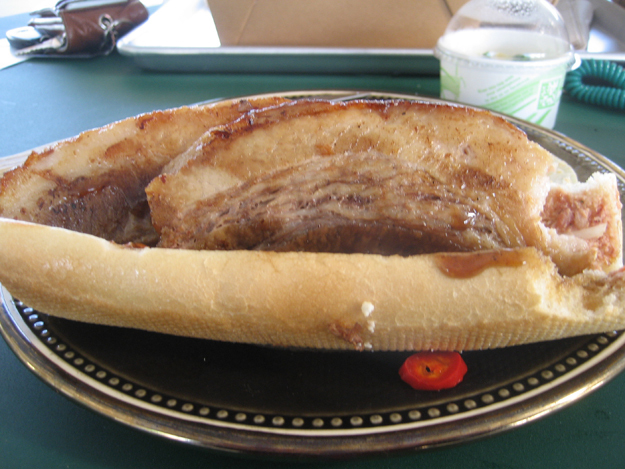 Yes, two huge slices of pork belly, and each slice was almost a half inch thick. Meaty and so delicious, redolent of Asian spices. (I believe it had been marinated in five-spice powder, and it brought back memories of Chinatown.) The baguette was just about perfect, and the cilantro onion and pepper added to the kick. Not much rabbit in evidence. I believe it was made into pate which, smeared on the bread, added to the range of flavors. There was also a tiny cup of cold noodles to eat alongside. This sandwich was a winner! My friends’ meals were just as good. Betty got a Lamburger ($9). It was made of a mix of lamb and shrimp ground together. Mostly lamb, not many shrimp, but the shrimp enhanced the meaty mix of flavors. I had a taste, and it reminded me a lot of the sort of ground kebab you’d find being grilled on the street anywhere between Ankara and Kabul. I loved it. There was a harissa sauce, which I didn’t taste, but since harissa is a Tunisian hot sauce I’m sure it added it a kick. Also fries, billed as Ras el Hanout Pita Fries. I didn’t taste those either so I’m not quite sure what they are. I think it’s crispy slices of pita bread served with Ras el Hanout, which is a Moroccan spice blend. What I did taste was the potato salad. Betty and I split a $3 order. The Tulsa World called this simple potato salad “fabulous”. It is. And Cathe got tacos ($7). 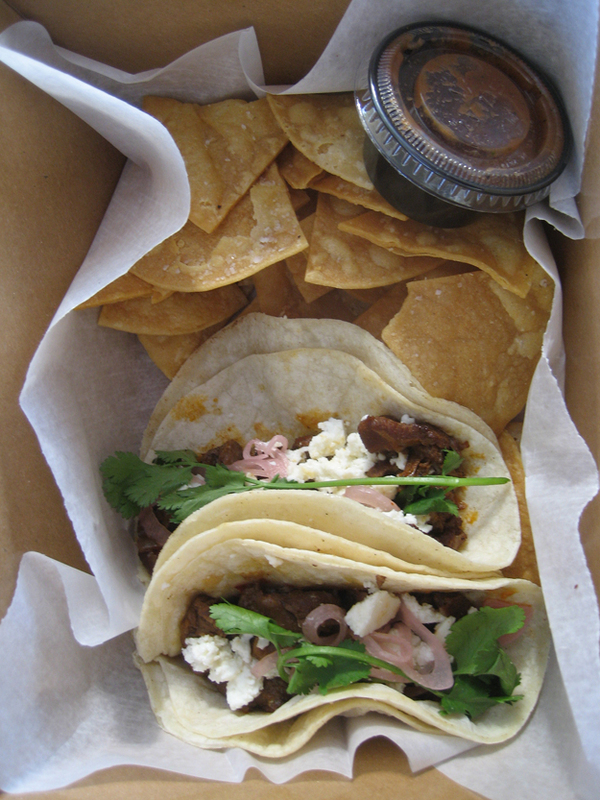 Berkshire Pork Cheek Tacos, Pickled Onion, Queso Fresco. Bursting with flavor, these are just the sort of tacos you’d hope to find in one of those nameless hidden taco joints around 21st Street and Garnett. They came with chips and spicy salsa. All made in house. In fact, most of the dishes are prepped and some are cooked at Lucky’s on 15th Street. One Wednesday I was having a very late dinner at Lucky’s (and if they ever have halibut en papillote on the menu, just get it, especially if it comes with morels, ramps and fiddlehead ferns fresh from the woods), and Nico was there. I told her I didn’t expect to see her working so late and she replied that she had to cook a whole lot of sandwich fillings for Lucky’s on the Green. I’m glad she did.